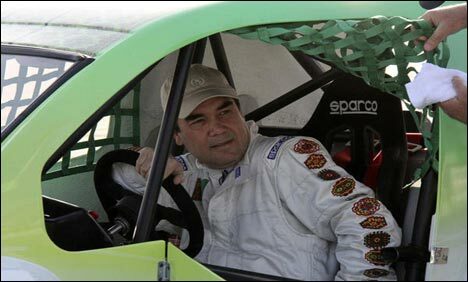 ASHGABAT, Turkmenistan: Turkmenistan's authoritarian leader has proven he doesn't only win elections easily, coming first in a car race he wasn't even supposed to take part in. President Gurbanguli Berdymukhamedov drove to the racing track in a Bugatti sports car Saturday morning ostensibly to give his blessing to the former Soviet Central Asian nation's maiden automotive competition. While an event presenter introduced the president, he received a request nobody in Turkmenistan would be likely turn down. "Can I take part?" Berdymukhamedov asked. Before long, the president had changed into racing gear, entered the zippy and diminutive Turkish-made Volkicar automobile and promptly proceeded to record the best time in the time-trial challenge. Announcers at the race said the winning car will be given to the national sports museum. The apparently choreographed display appears to be another episode in an ongoing state project to cast the president as an effortlessly competent man of action.